Woah, he's actually eating it, should I say something? No...what would I say? On Friday the FDA deemed safe the seafood caught in waters open for fishing, and they also confirmed that some 1.8 million gallons of chemical dispersants that were poured into the sea to dissipate the massive oil slick was unlikely to show up in the food chain. 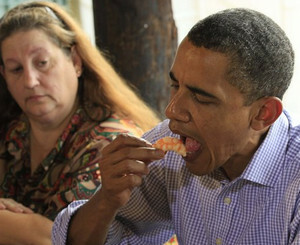 And since the FDA has been playing this strictly by the books, operating openly and honestly with the American public, Obama plans to serve Gulf seafood to his guests at his 49th birthday party. PR stunts like this are what creates stupid. Whether you believe the seafood is safe or poisoned, whether you believe the FDA has been honest, the idea that we are supposed to be impressed with the President serving Gulf seafood is ridiculous. People can smoke one cigarette and never catch cancer. People can eat Kentucky Fried Chicken and not have a heart attack. The scientists who question the safety of Gulf seafood never said you’d take one bite and drop dead. This is about long term effects and these effects are unknown because Corexit has never been used to this extent. Regardless of what the FDA says, they are finding evidence it has entered the food chain from Texas to Florida, primarily in crab larvae and they will be studying these effects from now into the far flung future. So, whether the food is safe really will depend on who you believe. Since the Deepwater Horizon rig explosion on April 20, 2010 an estimated 60,000 barrels of oil per day have leaked into the Gulf of Mexico (according to official government reports). That amount equates to approximately 224,280,000 gallons of crude. Some of that oil was captured by skimmers and boom, but a majority of it is still out there: either floating underwater, just out of sight, or dispersed into tiny droplets through the use of the detergent Corexit® (more aptly known by environmentalists as “hides it,” because that’s exactly what it does). Since British Petroleum capped the well on July 17th, the FDA has given the green light for consumers to go ahead and eat gulf seafood, claiming that it is safe. However, some fishermen are questioning the FDA’s judgment and guidelines in determining seafood safety. FDA tests regarding the safety of gulf seafood seem rather general. According to that department, if it looks bad or smells bad, then just don’t eat it. But many of the toxins in our environment can’t be seen or smelled. Take for example, the mercury found in Tuna and other large ocean water fish. We know that it can be found in their flesh, but we can’t detect it visually, or by smell. Even so, we know that ingesting these fish over a period of time can result in a host of health problems in humans, including kidney and nerve damage. I know that our government wants to aid the fishing industry to overcome the effects of this unmitigated disaster caused by BP, but at what cost…that of our own health? In my opinion, it is far too early in the game for anyone to declare that seafood caught in the Gulf of Mexico is safe to eat.